Portrait of Kurt Schwitters by El Lissitzky, 1929. “I use any material the picture demands.” Kurt Schwitters, 1920. Today marks the conclusion of an important Kurt Schwitters (1887-1948) retrospective, the first in the United States in over 25 years. Limited to three exhibition venues: the Princeton University Art Museum, the Menil Collection in Houston, Texas, and finally the University of California, Berkeley Art Museum & Pacific Film Archive (BAM/PFA), Kurt Schwitters: Color and Collage presents over 80 works by the 20th Century German born artist whose versatility spanned a variety of artistic mediums including painting, collage, sculpture, assemblage, and typographical work. Although associated with Dada throughout his life, Schwitters resolved to be his own movement. He called it Merz from a fragment of a phrase, which originally spelled Kommerz und Privatbank, he had cut out of a newspaper advertisement and incorporated into one of his art pieces. As with much of his work lost or abandoned during the rise of Nazism and the ravages of World War II, the collage painting which named his movement was removed, and likely destroyed, from a Dresen gallery by the National Socialist who deemed it degenerate art. It is all the more reason to celebrate this show which collects diverse works from various collections that span the entire length of his art making, from his earliest abstract collages made in 1918 to the final works which date 1947 after Schwitters had fled the Nazi invasion of Norway for England. Artists Jasper Johns and Ellsworth Kelly both loan multiple works to the exhibition. 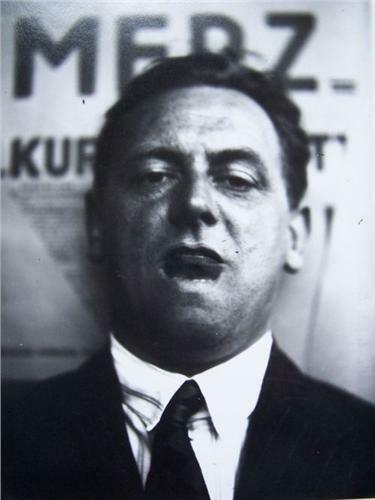 The show, which was organized by the Menil Collection, is curated by Isabel Schulz, executive director of the Kurt and Ernst Schwitters Foundation (and curator of the Kurt Schwitters Archive at the Sprengel Museum Hanover), along with Joseph Helfenstein, director of the Menil Collection. Berkeley Art Museum director Lawrence Rinder deserves credit for securing this superb exhibition for his museum and presenting it to West Coast audiences. Schwitters work adheres to a greater political emphasis than one might think at first glance. To the extent that Dada was a reaction to the chaos and inhumanity of World War I, Schwitters’ own abstract collage making, the picking up of disgarded paper and objects to make new things, is rooted in this conflict: “In the war, things were in terrible turmoil. What I had learned at the academy was of no use to me and the useful new ideas were still unready…. Everything had broken down and new things had to be made out of the fragments; and this is Merz. It was like a revolution within me, not as it was, but as it should have been.” As a result his art broke with convention and his affinity with the Dada movement was cast. Quoted in Harriet Janis and Rudi Blesh, Collage: Personalities, Concepts, Techniques (Philadelphia: Chilton, 1962). Schwitters worked his collage pieces laying them flat, which is particularly evident in those pieces signed in different places, which suggested they be exhibited in multiple orientations. The Untitled collage (Black Merz Drawing) is one such example, signed to allow for both a vertical and horizontal presentation, it underscores the pure essence of non-objective art. The piece dates from around 1925, yet its color is still crisp, with a dark background, and overlayed with blue, red, and yellow color fragments scattered around the picture plane. The composition presents the tumbling of paper downward, as if in movement. It is reminiscent of Jean Arp’s Collage with Squares Arranged According to the Laws of Chance (ca. 1916-17). In addition to presenting collage, lithography, sculpture, and paintings, a replica of Schwitters’ famous Merzbau (Merz building) accompanies the exhibition, the Merzbau being, in effect, Schwitters effort at creating a total aesthetic installation by building out interiors of his home utilizing the angles and hard edges so prevalent in his collage work, which one could live and work in. Beginning in 1923, on three separate occasions Schwitters worked on a different Merzbau. The first, made in Hanover, was destroyed by Allied bombing. The second Merbau created by Schwitters in Norway after he fled the Nazis in 1937 was accidentally destroyed in 1951 by children playing with matches. The third, begun in 1947 in England never saw completion. However in 1983 set designer Peter Bissegger completed his reconstruction of the central portion of the Merzbau, and this is on display at the Berkeley Art Museum. All exhibitions of Schwitters work in the United States are indebted to those collectors and curators who sought to promote his work during his lifetime. In particular, Katherine Dreier, an art collector who founded the Société Anonyme, Inc. with Marcel Duchamp and Man Ray, was the first in America to express interest in Schwitters’ work. Although her plans to give him a one-man show never materialized, she was responsible for the Brooklyn Museum’s 1926 show International Exhibition of Modern Art which included four paintings, 25 collages, and one sculpture by Schwitters, thus introducing him to art connoisseurs in this country. Although Schwitters never reached America, he was prescient enough to know his work would be well-received here. In a 1941 letter to his wife Helma, who remained in their native Hanover, Schwitters wrote “I shall enjoy great renown in America.” He died January 8, 1948, one day after being granted British citizenship. Schwitters’ work lives on. In addition to his visual art, he left experimental stories, poems, and plays, including his famous poem An Anna Blume (commonly translated as To Eve Blossom), which first attracted an international audience in 1919 for its originality and inventiveness, and various sound experiments including a 40 minute “primeval” sonata, Ursonate, which he composed between 1922-32, and which is still performed today. Kurt Schwitters epitomized the avant-garde in his day, and continues to do so. 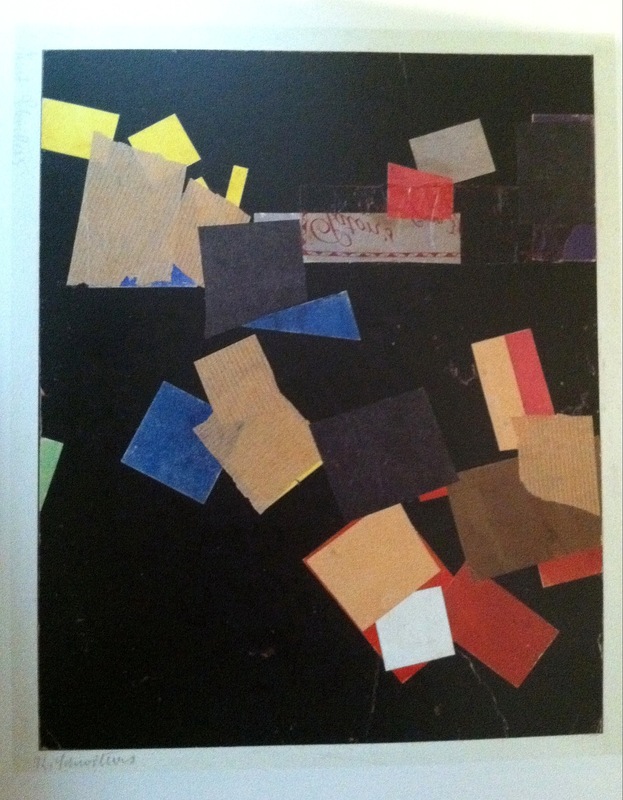 Kurt Schwitters: Color and Collage. Through November 27, 2011. Berkeley Art Museum, 2626 Bancroft Way, Berkeley, California. Great essay!!!! I’ve always loved Schwitters work.